Last week at the store, we had a tea party to celebrate the release of the newest American Girls, Cecile and Marie-Grace. It’s a first for American Girls, introducing two at a time, but their stories are woven together so they alternate books, and it switches up the formula a little. Our newest friends are from 1853 (’53! Every other American Girl ends in ‘4; heard a story that it’s because the company was founded in a year ending with a four, but who knows), in New Orleans, set against a Yellow Fever epidemic and orphans in desperate need of care from compassionate girls. The party by itself was a lot of fun. We got an event kit so we didn’t have to come up with anything too extraordinary, but we got snacks and made tea and invitedd girls to dress up and bring their dolls, and that’s where the fun is. Almost every single girl brought at least one doll; one brought so many she carried them stacked in a baby stroller, then set them all around her like a fortress on the table. Have a feeling that girl has a lot of solo tea parties with her dolls. Some of them came in matching modern clothing, though when we introduced Rebecca at her own event (last year? year before? 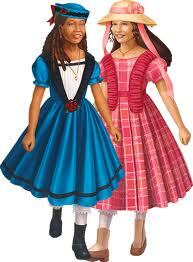 ), we had a handful match their dolls’ period costumes. Some of the dolls had tangled hair, some looked like they’d just come back from the salon, but in every case, it was clear these dolls were very loved. About half of them had the looks-like-me dolls, but even they could tell you their dolls’ stories, where imagination had provided them all they needed to give their girls backgrounds as rich and interesting as the official American Girls. And they’ll tell you. In a heartbeat. Some of them may not even wait for you to ask. That, to me, is one of the true wonders of American Girl. In a time when girls are drfiting to so many other things, American Girl manages to keep them thriving in imagination, not just with the stories but with the vast array of products. (By the way, THIS IS NOT A SALES PITCH) They have little craft kits that show you how to make props for doll school, doll diner, doll pets. They encourage you to MAKE doll clothing- and show it off! They keep girls playing make-believe. The other part, of course, is the history. I’m a history buff, so I love to see kids getting excited about historical fiction. They read about Felicity and they start asking questions about the Revolution; they read Addy and they start asking questions about slavery and the Civil War. It encourages them to question and explore and discover. I don’t remember when I started reading American Girl. It’s something that feels like it was just always there. When I had them, they were white books with a centered photo of the girl. The “Meet” ones all had the slightly turned out profile walking picture that always makes me think of Abbey Lane. At that point, there was Felicity, Kirstin, Addy, Samantha, and Molly. Yes, just five of them (I’m old!) Right as I was moving away from the books, they introduced Josefina. I never read much Samantha; not really sure why, except that I didn’t have the books. But I LOVED the others. I loved Felicity’s mischief, loved Kirstin’s similarities to members of my own family who came over from Sweden, and reading Addy let me talk to my dad about the Civil War. I even dressed up as Molly one year for Halloween because I looked so much like her, glasses and all. Their stories were amazing, full of laughter and joy and sorrow and hope and growth, full of things to be learned and things to be taught, but what made them all the more real to me was the fact that they were built off of our history. A girl I know in Kristianstad needed to get a loan just to come home. There was no real Felicity Merriman running around in 1774; but there were girls just like her. The highlight of my month used to be getting the American Girl catalog, not because I actually had any expectation of getting anything (I don’t know what the prices are now, but back then they were expensive!) but because I loved looking at the stuff. For the history, I loved learning about the different parts of the clothing, the styles and why they were popular. For the half that was the modern stuff for the looks like me dolls, I loved making stories around them. What kind of doll would wear that kind of outfit, and why? BOOM, instant story. When I was twelve, we came home from Christmas Eve services to find our house on fire. Well, technically it was the inside that was on fire, not the house yet, but there was a house and there was fire and smoke and really it was not at all a fun time. Later that day, when all the flames were out and the smoke had cleared a little, the firefighters brought out our Christmas presents. We’d put them somewhere other than the usual place and closed doors that weren’t usually closed to lock away pets that weren’t normally locked up- because of that, all the pets were safe, and when they handed us the wrapped presents, their gloves leaving streaks of soot on the paper, the firefighters got to see us burst out laughing. That night, after we had Christmas dinner with friends, we sat down and opened presents. And one of mine was an American Girl doll, one of the look-like-mes. She’d been wrapped and in all of her sealed packaging, but somehow just a little bit of smoke or soot had gotten through anyway and she had ashy smudges on her cheeks. And I loved her for it. I never sent her to the doll hospital to get cleaned (normal cleaning didn’t touch it) because my doll, like me, was a survivor. Her house caught fire like Kirstin’s but we were going to come out of this and, with some hard work and sacrifice and a lot of changes, things were going to get better. Fourteen years later, still with the ashy smudges on her cheeks, Lexi came with me to the tea party. She’s older than all of the girls who came and has been in the same nightgown for ten years or so because somewhere in the seventeen moves I’ve made since then, all of her clothing got lost and I couldn’t afford to replace it/wasn’t skilled enough to make it. Her hair is in two French braids with mismatching ties, but this was before they changed the way they crafted the hair and skulls to allow for more intricate hairstyles, so really there are two braids on the side and then in the middle there’s a giant swatch of fabric with lines of sewn-in hair. She’s a little battered, but fourteen years later, she’s still a survivor. And she’s still helping me make up stories. I’ve never understood why American Girl doesn’t spawn off a brother company for American Boy. Understandably the dolls wouldn’t be a big hit with the boys but there are so many other ways to provide for them, and I think it does the boys a disservice not to give them historical fiction that is so incredibly accessible. Not to mention the vast array of non-fiction books that have been godsends for so many parents and children dealing with the terrifying world of middle school and puberty. American Girl? PLEASE give our boys the amazing experiences you gave us girls. Do you have an American Girl story? Please share! Oh gosh. My friends and I were American girl freaks. I had two friends with Samantha, one with Kirsten and one with Molly. It took me a couple of years, but I eventually got my own doll: Felicity. I think she was my favorite because of Penny. I still remember when I got her. It was just after Christmas and the first of my three hospital stays during my childhood. My best friend at the time came over to my house and handed me this huge box. Inside was Felicity. I was so exuberant that I managed to bang her braces against her lip. We swapped dolls clothes (I still have a some of hers) and accessories until we outgrew them. Recently, I was cleaning out my closet and there she was, hidden in the back. She’s a little battered. her hair is darker than is normal for some reason. She got a pen mark on one of her hands. But she’s mine. And I still love her. And I hope one day I can pass her along to one of my girls.